While tools such as Web 2.0 applications, IM, P2P and portable USB media can be great for business innovation and productivity, they can introduce significant risks when not managed properly. Unfortunately, too many organizations fall into two extremes when it comes to reining in these risks. On one end, very security-conscious organizations have reacted by simply banning these technologies — a practice quickly falling out of favor among line-of business leaders. And on the other end of the spectrum, many more practical organizations have chosen to develop acceptable-use policies for these tools without any real enforcement. To truly realize the benefits while curtailing the risks, organizations must find a way to strike a happy balance that allows for the safe use of new technologies. 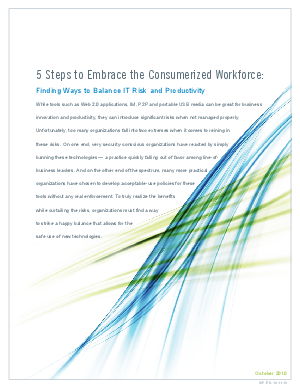 Learn how to strike a happy balance that allows for the safe use of new technologies – without the risk.